Wow, your garden is doing great! We have a few little green tomatoes now so there is hope for some to eat soon. I will be thinking of you out there backpacking with the kids. I like your attitude toward bringing up the rear and enjoying yourself cause that is where I would be, too. We had a great week for grocery deals. Wise Buys grocery outlet had cases of 48 bags of cheese puffs that we love for $5. Thomas’s English muffins in packs of 9 for $1. huge bottles of BBQ sauce were 1.99, 12 packs of chocolate milk in aseptic cartons were 1.99, etc. And our downfall is they have Entemann’s baked goods for $1.25 and we always end up with something yummy. Then another store had a sale starting at noon on Friday and we got shredded cheese buy one get two, baby back ribs for $2.48 a pound, pita bread for .79 a pack, ice cream 3 for $4, cones were .28 a pack with coupons, Manwich sauce was .78, Pringles chips ,48, BBQ sauce was .98, bacon was 1.98, etc. They have these noon on Friday sales about once a month and next time we need to get there earlier as things sell out quick and no rainchecks. Those are crazy sales! I love our Grocery Outlet–you just never know what you are going to find, so I just go armed with $$ and get what they have. If I ever saw ice cream 3 for $4, I cannot even tell you how many I would buy, but it would be as many as I could fit into the freezer! We might even have to have an ice cream feast if we got home and they didn’t all fit!!! We don’t have sales that start at noon here, but there are other gimmicks that we enjoy joining in on. Yesterday, Fred Meyers (Kroger) had Miracle Whip and Mayo for 99c. You could have 5, so I mixed and matched. Then, huge ketchups for 99c. Charcoal was $3.99 for the 15+ lb. bag, and there were a couple other things I didn’t buy. We were in a super big hurry, so for once, we grabbed only what was on sale, then got out of there. I also grabbed my Friday Freebie that I was super surprised to see was still in stock. Usually, if you wait until Saturday, the item is gone. With just the two of us we usually only buy one carton of ice cream at a time but hey we could not pass up getting three at that price! If we have to we will make milk shakes to use it up. Wow! Mayo for 99 cents! Great deal for summer potato salads, etc. Milk shakes sound wonderful! I have to hide the ice cream in the shop freezer, or it will be all gone in a day. So, when I bring one in….it’s history:). 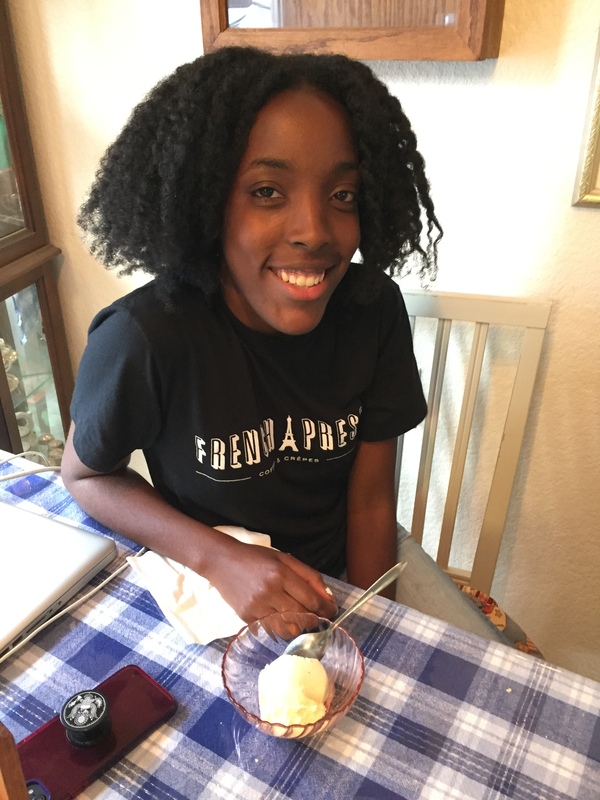 Lots of ice cream eaters around here. Great picture with the backpack! I totally admire you for going on the trip. A camper in any form I am not, but I do enjoy hiking. I love hiking, and Rob and I used to backpack quite a bit before the children took over our lives. We took the first 3 backpacking, but there was something about all that crying and howling that kind of quenched our fun:) So, we gradually moved over to first tent camping, then a small trailer, then a bigger one….so all the kids could fit in and be comfortable. We took Alissa camping a lot when she was little, and now I have to say I am amazed and delighted that she has discovered that she loves backpacking. This will be Patsy’s first time, but I’ll bet she’s going to love it, too. J wants nothing to do with it:). So, each to his/her own. I’m hoping it’s as fun as I remember. I hope you will post pictures and tell us all about it! Oh, I will! I’m planning to take my phone to take pictures with. 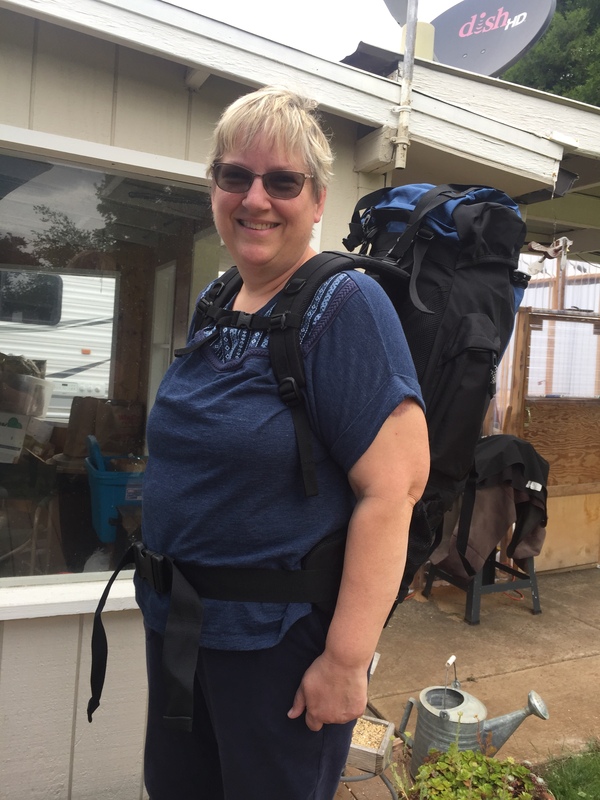 I was practicing today with my pack, and Rob helped me re-load it so it was more balanced, and tighten the straps so it was better for me. I still need to gather my food up and put it in the pack, and I’ll be ready. Thanks! I have a few peas on my bush, but it takes so many to make a bowl full, so I’ll bet most get eaten off the vines! 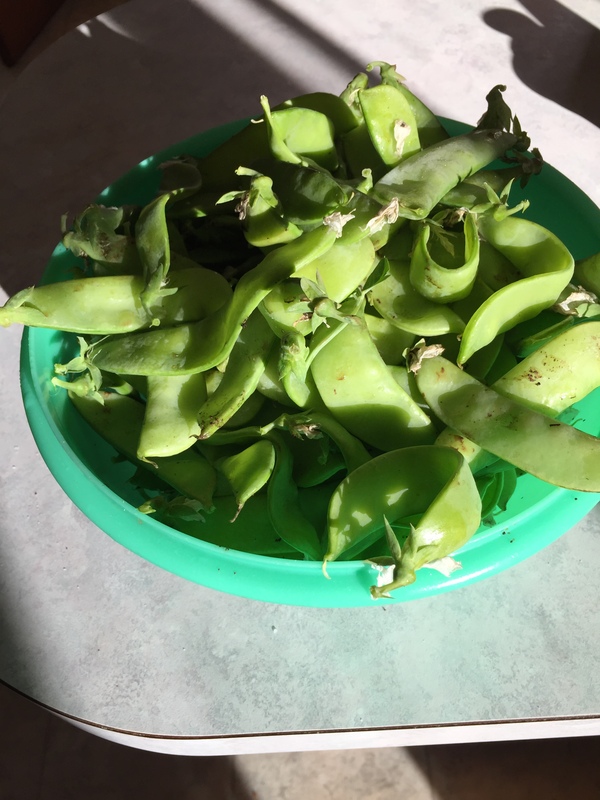 The snow peas, however, are so prolific, I’m going to feed them to the college class at church tomorrow night, as we are cooking for them. I read your comment on Brandy’s blog – I hope you had better success on the 2nd day investigating health insurance options. I know first hand how difficult getting answers from govt agencies can be. And wow, 3 +hours a day for some of the contract jobs and no insurance — who are they trying to get as employees? Seems very short sighted and not in the student’s best interest. But I know you two are very resourceful and I’m looking forward to reading how this all works out. I spent time this morning watering. We’re having a mini heat wave up here. One of my community gardens has a watering calendar for member’s to participate in and it was my turn to water all the beds. It’s only 16 beds so I was able to knock it out in just under an hour. 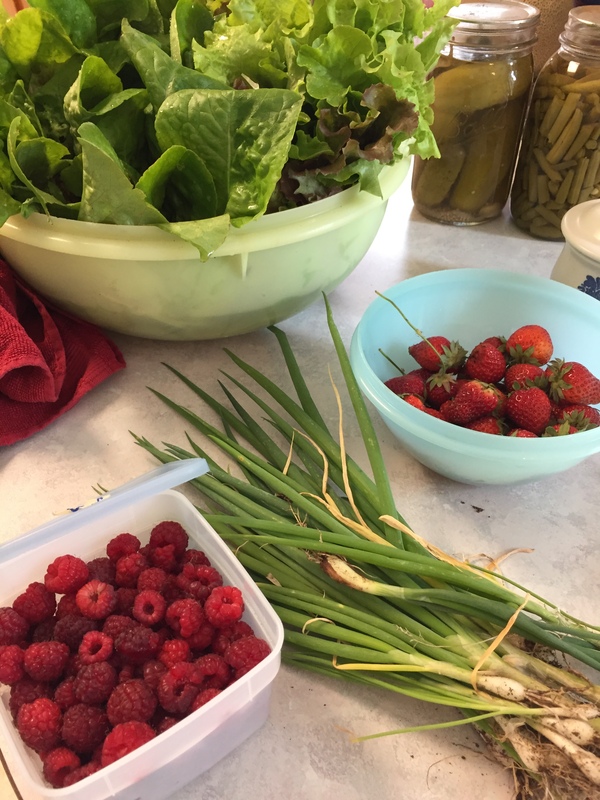 And,while watering there, I had a lovely chat with the woman who grows a market garden on some of the property.. She farms on the acerage and sells at a farmer’s market on Saturdays. She told me to help myself to anything she brings back, for free. Can’t wait to see what’s there next Sunday!! That’s so exciting about the vegetables! She’s probably glad to see them not get wasted, and you are very glad to help use them up! We went to the office we were told to go to today. The man was there. He was not busy. I had the forms I was given yesterday filled out as best as I could, and sticky notes in places I didn’t understand. There were lots. I think we are complicated! He collected everything we gave him (documentation, pay stubs, etc.) and we left it with him. He says we should know in a day or two if we qualify or not. I was pleasantly surprised, and am now waiting to see what happens. Such a better outcome today! Yes! Now, here’s hoping that we really do find out one way or the other in a couple of days. Our days are ticking past, and we’d like to have this settled, and if we get no for an answer, we need to find him another job by fall. 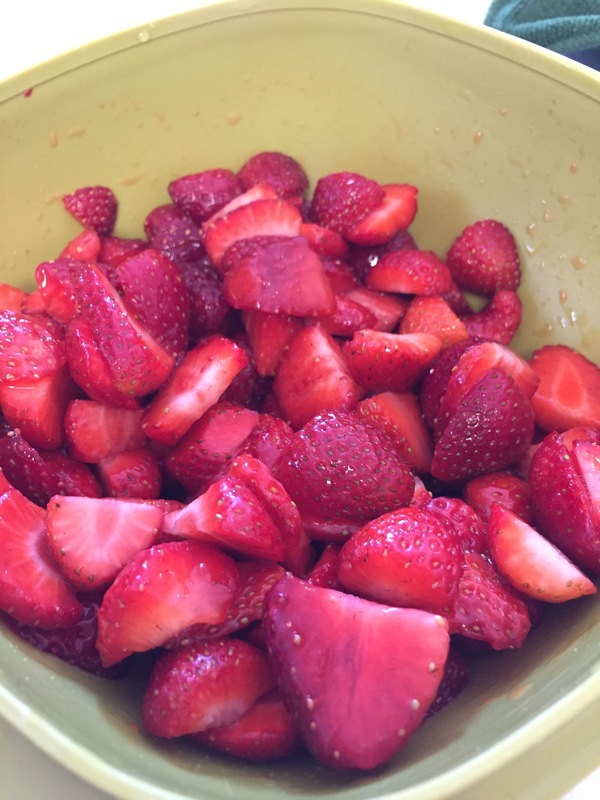 I love how much fresh produce you are getting from your garden right now. I ate the first cherry off our tree today.and picked a strawberry from the plants there. I also harvested rhubarb and baby kale. I am hoping to make Zuppa Toscana with the kale tomorrow and then pick, wash and freeze more. It does feel like the garden is really starting to “come in.” I love this time of year! I think I have finally caught up reading all of your posts! I was hoping to hear good news about Rob’s job by now. I suppose the good news will be in the next post. Your garden is doing great! Mine is so far behind and much smaller than the garden last year at this time. My strawberries are almost finished for now but I know they will take off again soon since they are everbearing. I had hoped to fill up my freezer but we keep eating them. Have fun backpacking and take lots of pictures. I will be glad when we hear good news, too. He just had another interview this morning. We estimate that around 300 people did not get their contracts renewed, if we multiply the amount from his school x the amount of schools in the district. Competition is pretty fierce. He did not get the one he interviewed for last week. It took him 80 applications and 10 interviews to get the last job. He is also starting to explore other options in a different area. I can’t imagine the pressure on a family man who is supporting a family. He is blessed to be married to a woman who manages every penny with wisdom. Thank you. That’s nice of you to say. He is feeling the pressure, today and yesterday, especially, once he found out he did not get that other job he interviewed for. Even though we know logically that the chances are pretty slim, since the competition is so fierce, and it took 10 interviews last time, he was still disappointed, which makes sense. Have you thought about him getting his teacher’s credential? In WA state, years ago, they’d give out ‘temporary’ credentials to anyone with a BA. I don’t know if that’s still happening or not. Or another degree, even an AA, from a JrCollege? I know that’s a longer term solution to the short term need. If it’s any encouragement –I went back to school later in life for my accounting degree. With only a few courses taken, I started working for a temp accounting agency and made ok money. I hit the jackpot when I got on at UW in Seattle. Loved working on a college campus. I remmeber the days of sending out all those applications and the rejection letters though. So discouraging. It seemed like getting a job was a job. Around here, they want you to have a master’s degree to teach. They seem to have plenty of people who do. To be truthful, I don’t think Rob likes the idea of teaching enough to jump through all those hoops–he would probably go into another field entirely. I was in a similar situation when I moved to Canada – to be certified here as an accountant would have been two years of school and passing a national test. It wasn’t worth the cost either. And I’m not sure I could have passed the test again, honestly. Not worth it to me when I was mid50s. How about any state run retraining programs for ‘mature’ workers? As in …something that wouldn’t put you in debt. Looks like your garden is coming along great! I’m so glad you are able to harvest some produce, already! I love snow peas in stir-fry and other dishes. I am sorry Rob was disappointed that the interview didn’t have the desired outcome. I hope the next interview will be better. I hope you enjoy your backpacking trip and have a fun time! I’ve never gone backpacking, to be quite honest! I’ll enjoy it through your pictures and posts about it! Take care, Becky, and know that we are all hoping and praying for Rob to find a good job with benefits. Thank you. Rob and I used to go backpacking years ago, and even took groups of kids on trips when he was a teen-age youth pastor. It’s been many, many years, though, so I’m a bit anxious that I’ve forgotten something. I’m sure it will be fine, and I’m really excited that it’s finally here tomorrow morning bright and early.